Designer Outlets Wolfsburg offers big saving on fashion labels in a large factory shopping village mall in the center of the city near Volkswagen Autostadt. Nearly a hundred top German, European, and a few more international brands have factory outlet boutiques at the Wolfsburg designer fashion mall with savings up to 70% over high street shop prices. Parking is plentiful while the Wolfsburg train station is only a block away. 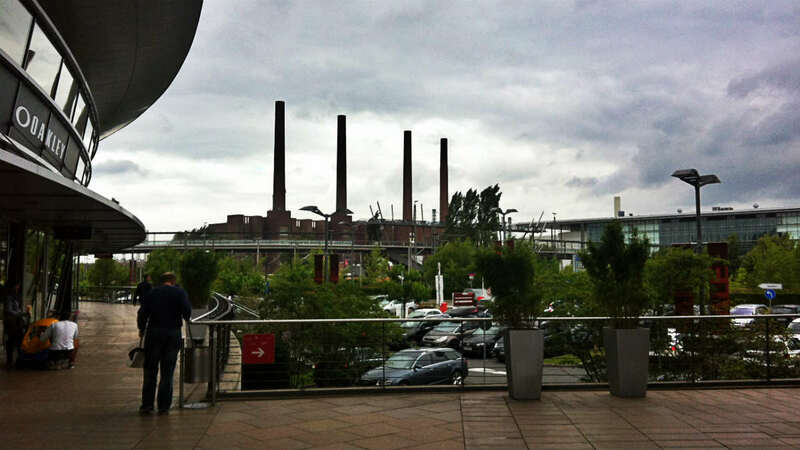 Volkswagen’s massive Autostadt (and factory) is within visual distance allowing visitors to add a savings shopping trip to a day of car watching. Designer Outlets Wolfsburg is a large factory boutiques shopping mall. In contrast to other fashion outlet malls in Germany, the center is in the heart of Wolfsburg city and is a modern shopping mall rather than a cutesy faux traditional village next to an autobahn. The factory stores sell mostly overstocked and previous season items. As the fashion industry’s calendar works, this may be ideal for shoppers who prefer to actually buy summer clothes in summer rather than in late winter or spring. The biggest savings are often on B-graded items but these are in limited supply and always well marked as not being up to brand inspection quality. Check these items thoroughly, as they cannot be exchanged, but the faults may be as minor as a spelling mistake or misprint on the label. Brand-name designer clothes, shoes and fashion accessories are on sale in the majority of boutiques in the shopping mall. A few shops also sell household items such as Rosenthal porcelain and Le Creuset pots and cooking accessories. Lindt sells Swiss chocolates at huge discounts. Abercombie & Fitch, Adidas, Brax, Bruno Banani, Bugatti, Calvin Klein, Camel Active, Desigual, Diesel, Dockers, Falke, Fossil, Gant, Lacoste, Levi, Marc O’Polo, Mammut, Nike, Oakley, O’Neill, Polo Ralph Lauren, Reebok, Salamander, Superdry, Timberland, Tom Tailor, Tommy Hilfiger, and Vans. The mall has a small café and bistro but visitors would do well to eat and drink elsewhere. Foreign visitors residing outside the European Union may claim back value added tax if purchasing items for more than €25 in a shop at Wolfsburg Designer Outlets. Request in any shop the relevant forms and exact procedures that should be followed. Around 15% of the purchase price may be refunded when departing from Europe. Items must be shown unused at the airport customs counter. Getting to Designer Outlets Wolfsburg, An der Vorburg 1, 38440 Wolfsburg, is very easy. It is the only traditional factory mall outlet village in Germany located in the heart of a city. No need to travel to the industrial outskirts off an autobahn exit in the provinces, this outlet mall is right in the center of Wolfsburg directly next to the ICE train station (Bahnhof) near the Volkswagen Autostadt, VW Museum and factories. Plenty of parking is available at the mall at only 50c per hour (maximum 4 hours) and often free. Opening hours are Monday to Saturday 10 am to 7 pm (closing 8 pm on Friday and Saturday). Designer Outlets Wolfsburg is closed on Sunday. Designer Outlets Wolfsburg combines well with a visit to the large Volkswagen Autostadt and the nearby VW AutoMuseum, which is separate from Autostadt and much more traditional marque museum.